After yesterday’s commute-hour blowout, several people asked me which Supervisor they should write to register their concerns about future N-Judah failures and more. This reminded me that it is time to update this old post about which supervisors have the N-Judah line running through their districts. 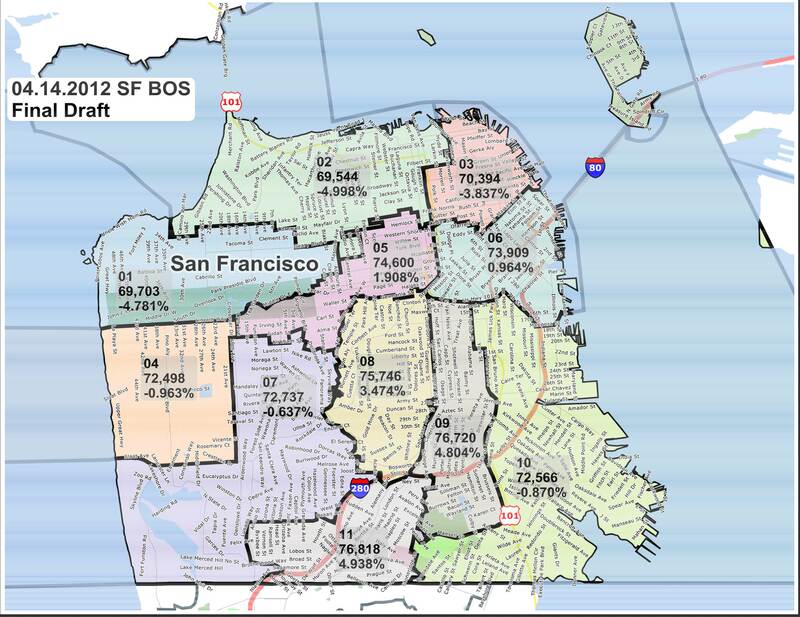 – Supervisor Katy Tang – Again, the most obvious, as her district is the one that includes Ocean Beach, etc. Sup. Tang used to be an aide to previous Supervisor Carmen Chu (who is now the Assessor). Both sort of owe their careers in a weird way to the conviction of Ed Jew, but we’re not supposed to talk about that apparently…. – Supervisor London Breed – Distict 5 is one of those weirdly drawn districts that includes the Inner Sunset and Cole Valley, and the N rolls through both. I gave the incumbent Supervisor some light-hearted jabs on Twitter, as she made some big announcement about “banning Styrofoam” (didn’t we do that already?) the same day the N had a big fail. Joking aside, I sure would like to hear what her plans are to help the N, and Muni in general, sometime. – Supervisor Norman Yee – In yet another iteration of Weird District Lines, there are parts of the Inner Sunset where you can cross Judah Street and find yourself in different districts. Thus, while the N Judah makes its way down Judah St., half the people who are riding it might be in Sup. Breed’s district, and half the people might be from Sup. Yee’s district. Again, whoever draws these districts really needs to take a visit out here and see how this isn’t serving anyone well. – Supervisor Scott Wiener – Sup. Wiener has been a sort-of advocate for Muni during his time on the board, and he’s good at making headlines for Saying The Right Things. He’s also a regular Muni rider – one of the few in City Hall, and something noted in our interview with him in 2010 at the Muni Rider Voter Guide. And he’s running for the State Senate, too! – Supervisor Jane Kim – The N ends at Caltrain Station and winds through Sup. Kim’s district, past the ballpark etc. Interestingly enough, she, like her colleague Scott Wiener, is also running for State Senate. One has to wonder why both of these Supervisors are so eager to leave their current jobs before moving on to the next one. Do they know something about City Hall we don’t? “LOL!” Seriously, though, having dueling Supervisors running to get the N-Judah rider vote could be good for you, if they both think a better Muni would serve their interests as well as yours…. Anyway, there you have it. For more information about the Board of Supervisors or the SFMTA, consult your local library or Google things on your Pocket Supercomputer! This entry was posted in MUNI/SFMTA, News & Politics and tagged boardofsupervisors, cityhall, commute, fail, sanfrancisco, sfmta, supervisors. Bookmark the permalink.